If you’re thinking of bypassing this post because you don’t like Brussels sprouts you’re making a big mistake! I’m here to change your mind about this (sometimes) hated fall vegetable. I didn’t grow up eating Brussels sprouts, but have tried them in different forms over the past few years and have settled on my favorite tried and true method to get even the haters to admit that they’re good. The secret – roasting. Roasting ups the flavor on almost every vegetable by concentrating the flavor and caramelizing some of the sugars (think roasted carrots). Check in the middle of the baking time to flip them and ensure they brown evenly. 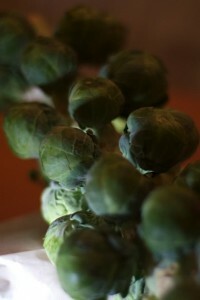 Brussels sprouts are commonly found individually in large bins or small bowls. However, many farmers markets and some supermarkets carry them on the stalk. Brussels sprouts are members of the cruciferous family (broccoli, cauliflower, bok choy, cabbage) and confer some of the same cancer fighting protective benefits. 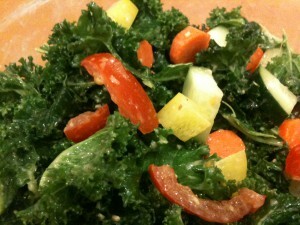 These powerful sprouts also provide vitamin K, antioxidants A and C and are a good source of folate and fiber. 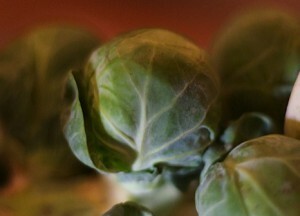 Look for Brussels sprouts that are firm and green and store them in the vegetable drawer for up to 10 days. While roasting is a tried and true method of prep, the recipe for Brussels sprouts with Maple Syrup from the Oct 2012 issue of Bon Appetit brings them to the next level. The hint of sweetness from the syrup coupled with the salt and herbs is an irresistible combination that will make many appearances on my dinner table, starting with Thanksgiving. The recipe isn’t available online so I’ll give you the abbreviated version: prep the sprouts as for roasting and and cut them in half lengthwise. Heat oil in a skillet and roast cut side down until brown, approx 4-5 minutes. Season with salt and pepper and transfer to a bowl. Add 2 Tbs of butter and 1/4 cup syrup (per 2 lbs of Brussels sprouts), and 1-2 Tbs each of parsley, chives and sage to the pan on med-low heat. When the butter is melted add back the sprouts and toss to coat. Serve hot. 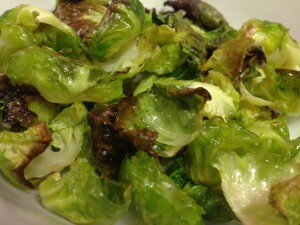 Another excellent recipe is for Brussels sprouts chips. If you’re like me and think that the browned leaves are the best part, then you’ll also love this recipe from Inspired RD. A word of caution – go easy on the oil or else they’ll come out soggy. And, be a little liberal with the Kosher salt. 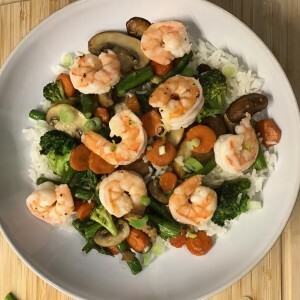 These were so crunchy and delicious I wasn’t sure there would be any left for my guests by the time dinner rolled around. I challenge you to try one of these recipes at your next dinner party. Your guests will be pleasantly surprised and you’ll see how many new Brussels sprouts lovers are created!